The former Mayor of Naas has reacted strongly to the decision by Fine Gael to remove the party whip following his controversial remarks about African immigrants. 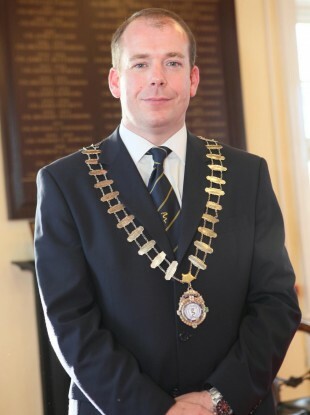 Darren Scully in his former role as Mayor of Naas. THE FORMER MAYOR of Naas, who has lost the Fine Gael whip following controversial remarks he made about African immigrants last year, has said he has paid a “very high personal price” for what happened. In an interview with TheJournal.ie Darren Scully said that he felt there was a “witchhunt” against him and accused the Labour TD who reported him to the Gardaí about his remarks of possibly attempting to “garner a bit of publicity for himself”. Scully resigned as Mayor of Naas last November and apologised for remarks he made in a number of radio interviews where he said that he was no longer going to represent African immigrants because of their “aggressiveness” adding that they were “quick to play the race card”. His remarks were widely condemned at the time but Scully cited the reaction of leaders of the African community in Ireland to his subsequent apology and the criticism he received as punishment enough. “After resigning as Mayor and offering a genuine apology, members of African community accepted my apology and said it was time for everyone to move on,” he told TheJournal.ie. I felt that most people would have accepted my apology but the party have taken the decision to sanction me once more, punish me once more on top of everything else and I’m very disappointed. Scully, 38, said that he not yet made a decision on whether or not he would continue to be a member of the party but noted that he had stood for Fine Gael in the 2005 by-election and the 2007 general election “when people didn’t see the party as fashionable”. He said that he had not been selected to run in the last election “when it was fashionable to run for Fine Gael” adding: “I feel let down by this decision. It’s a reaction to appease certain people within society. It’s unfair to me who has apologised and resigned. Scully also said that he had been the subject of two complaints under the Prohibition of Incitement to Hatred Act 1989 including one from Labour TD Aodhán Ó Ríordáin, which he described as “ludicrous”. A file regarding the complaints is currently with the Director of Public Prosecutions but Scully said it had been terrible for him to “find myself in a police station being interviewed” about his remarks. On Ó Ríordáin receiving hate mail following his complaint to Gardaí, Scully said: “I have heard what happened to him. It’s not acceptable in any society. “Everybody is entitled to their views and their opinions. People are entitled to their views and opinions as long as they are not threatening or insulting to any group. What happened to him was not right. “I do think though that we’re in dangerous ground. When people say something, I don’t think people should start phoning the police. What I said was not incitement to hatred. What he did was a little bit jumping the gun and maybe trying to garner a bit of publicity for himself. He should have at least rang me to discuss it. Scully added that he had been “heartened” by the reaction of the African community to his apology for his remarks. He also said that he would “absolutely” continue as an independent councillor and be putting his name forward for re-election in the 2014 local elections. The father-of-three added that he could not comment on his current employment situation. The engineer had previously said that he feared for his job prospects in light of the controversy his original remarks had caused. Email “Darren Scully: 'Some people won't be happy until I am deported'”. Feedback on “Darren Scully: 'Some people won't be happy until I am deported'”.